Ayata, Kutan. “Ruptured Flows: An Argument for Nonlinear Workflows,” (AD, 2017), 90-95. Benjamin, David. “Beyond Efficiency,” Birkhäuser Generalstandingorder : Digital Workflows in Architecture : Design – Assembly – Industry (Basel, CHE: Birkhäuser, 2012), 14-25. Carpo, Mario. “Tempest in a Teapot,” Log 6 (2005), 99-106. Doscher, Marty. “Disposable Code: Persistent Design,” Birkhäuser Generalstandingorder : Digital Workflows in Architecture : Design – Assembly – Industry, ed. Scott Marble (Basel, CHE: Birkhäuser, 2012), 207. Fischer, Thomas. “Geometry Rationalization for Non-Standard Architecture,” Architecture Science (No. 5, June 2012), 25-46. Garber, Richard. “Digital Workflows and the Expanded Territory of the Architect,” (AD, 2017), 6-13. Kilian, Axel. “Computational Design as a Process to Support Design Exploration rather than Design Confirmation,” in Dosya 29: Computational Design (November 2012), 43-46. Leach, Neil. “Digital Morphogenesis,” AD (Volume 79-1, 2009), 32-37. Lorenzo-Eiroa, Pablo. “Form in Form: On the Relationship between Digital Signifiers and Formal Autonomy,” Architecture in Formation: On the Nature of Information in Digital Architecture, ed. Pablo Lorenzo-Eiroa and Aaron Sprecher (Routledge, 2013), 12-23. Marble, Scott. “Editor’s Notes: Authorship,” Birkhäuser Generalstandingorder: Digital Workflows in Architecture : Design – Assembly – Industry (Basel, CHE: Birkhäuser, 2012), 26. Accessed 23 February 2016. ProQuest ebrary. Marble, Scott. “Introduction, From Process to Workflow: Designing Design, Designing Assembly, Designing Industry,” Birkhäuser Generalstandingorder : Digital Workflows in Architecture : Design – Assembly – Industry (Basel, CHE: Birkhäuser, 2012), 7-11. Maturana, Humberto, and Daniel Rosenberg. “Design as Doing: A Conversation with Humberto Maturana about What Designers Do,” in Dosya 29: Computational Design (November 2012), 19-23. Mayne, Thom. “Shift 2D to 3D,” Birkhäuser Generalstandingorder: Digital Workflows in Architecture : Design – Assembly – Industry. (Basel, CHE: Birkhäuser, 2012), 202-203. Mennan, Zeynep. 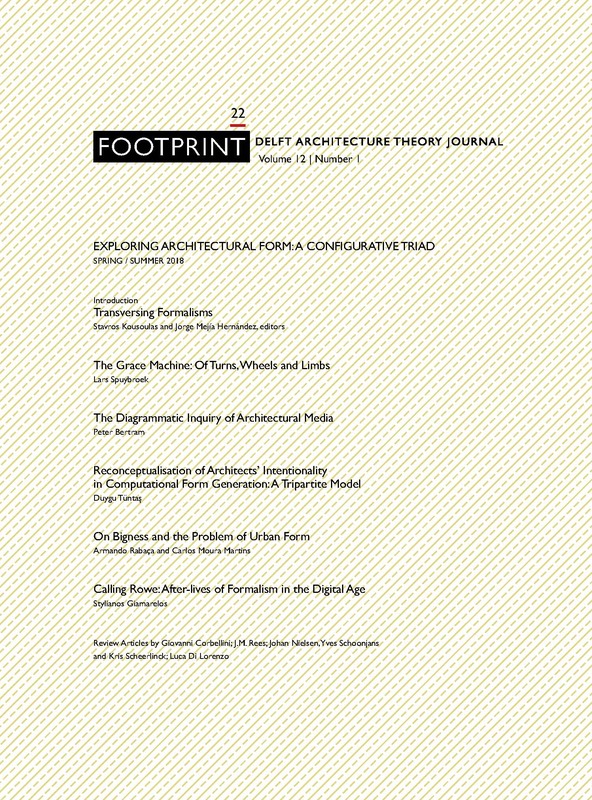 “Mind the Gap: Reconciling Formalism and Intuitionism in Computational Design Research,” Footprint: Dynamics of Data-Driven Design (Delft Architecture, Autumn 2014), 33-42. Michalatos, Panagiotis. “Design Signals: The Role of Software Architecture and Paradigms in Design Thinking and Practice,” AD (5/2016), 109-115. Mitchell, William et al. “Top-Down Knowledge-Based Design,” CAAD Futures Digital Proceedings (1989),137-148. Olsson, Mats-Olov. “Schools of System Thinking – Development Trends in System Thinking,” in Systems Approaches and their Application: Examples from Sweeden, (Eds) Mats-Olov Olsson, Gunnar Sjöstedt (2004), 31-74. Education in the Computer Era, ed. Malcolm McCullough et al. (MIT Press, 1990),17-30. Wiscombe, Tom. “Emergent Models of Architectural Practice,” Perspecta 38 (2006), 59-68. Having received her undergraduate and graduate degrees from the same department, Duygu Tüntaş is currently a PhD candidate and full-time faculty member at Middle East Technical University (METU) Department of Architecture, in Turkey. Her research interests include architectural form processes and computational design research. She has been awarded several prizes in architectural design competitions and received a Fulbright visiting scholarship for her PhD research. TÜNTAŞ KARAMAN, Duygu. Reconceptualisation of Architects’ Intentionality in Computational Form Generation: A Tripartite Model. FOOTPRINT, [S.l. ], p. 51-64, apr. 2018. ISSN 1875-1490. Available at: <https://journals.open.tudelft.nl/index.php/footprint/article/view/1756>. Date accessed: 21 apr. 2019. doi: https://doi.org/10.7480/footprint.12.1.1756.